There seem to be a never-ending source of recipes that use “cooked chicken”. I am not a fan of buying rotisserie chicken (see Costco Rotisserie Chicken) so I cook my own. 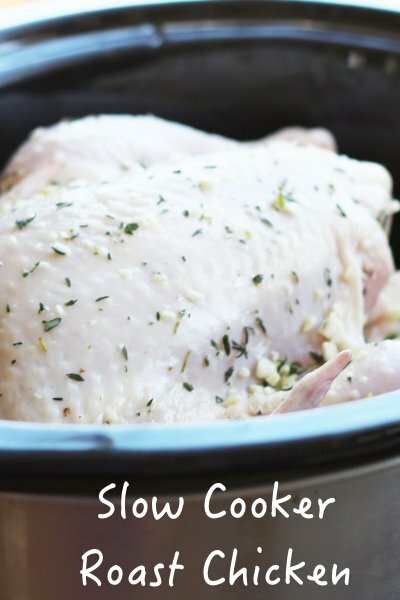 I have tried numerous recipes in the oven to get a perfect roast chicken. Many home chefs spend a lot of time on the quest for the best roast chicken (me included). 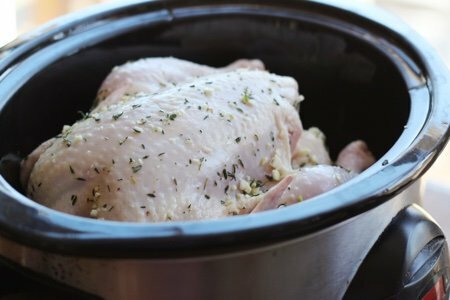 Slow cooker roast chicken is not perfect (you can forget it) – BUT – it is incredibly convenient and tastes pretty good. My biggest issue with the results of the slow cooker is that the chicken skin doesn’t get crisp like it does in the oven. I don’t eat the skin much anyway so it isn’t that big of a deal. I served this with roast asparagus (spring!) and my family enjoyed it. I had some fresh thyme in the house so I used it (and it was amazing). Don’t worry if you don’t have it. The carrots and onion in this dish are for flavor not and will be quite soggy. I love the simplicity of this dish and the tastiness of the chicken. I make a chicken for the week and then we have chicken salad, chicken on salad, and easy leftovers for the lunchbox. How do you cook chicken for easy recipes? Place carrots and onion in the bottom of a 6-quart slow cooker. Mix garlic, thyme and salt in a small bowl. Pat your chicken dry (without rinsing) with paper towels and rub the garlic mixture over bird. Place chicken, breast side up, in slow cooker and cook on low for 4 hours or until the thigh meat reads 160 F.
Once you pull most of the meat off the bones, boil the bones and the mushy veggies in water to make broth! A way to get even more out of your bones and veggies. I love roasting whole chickens, I'll have to try this method. If you debone the chicken right away, you can put the bones right back in the crockpot (yay, no extra dishes!) with the mushy veggies, a bay leaf, some peppercorns, and enough water to cover it all. Then cook it on low for several hours until all of the bones are brittle. Strain and refrigerate. There will be a layer of fat on top of a gelled layer, so it's easy to remove. You now have stock, and it is a very low-fat way to add tons of flavor to lots of dishes. It can also be put in freezer bags and frozen for months. does the chicken brown and crisp? Please stop rinsing your chickens. This spreads bacteria around the kitchen sink. Just pat dry, season and cook. Nanc beat me to it. Rinsing spreads bacteria. Slow cooker method does not make the chicken browned and crispy. Veggies should be added in the last 20 minutes to half an hour so they do not get mushy if you are using the high setting on the slow cooker. If cooking on low heat, I would put them in sooner. I often use my French oven to cook various meats that I have browned first in this vessel. As for the chicken, if you want it browned with the French oven method, it should be roasted in the oven. Or, roast in a racked pan made for this option. If you want crisp skin all you have to do is torch it. Of course you have to have a torch but it works really well. I Purchase A 1 lb. Chicken Breast, Steam It Then Slice It 8 Portions Because I Detest High Sodium Chicken. So sorry about the rinsing of the chicken - whoops! I have changed it to "pat dry with paper towels". Do not rinse your chicken as it spreads bacteria around your kitchen. The skin does not get crisp. I am assuming that you will be tossing the skin out (but keeping it on for roasting as it helps keep the meat moist). Thanks for all of your questions and comments!